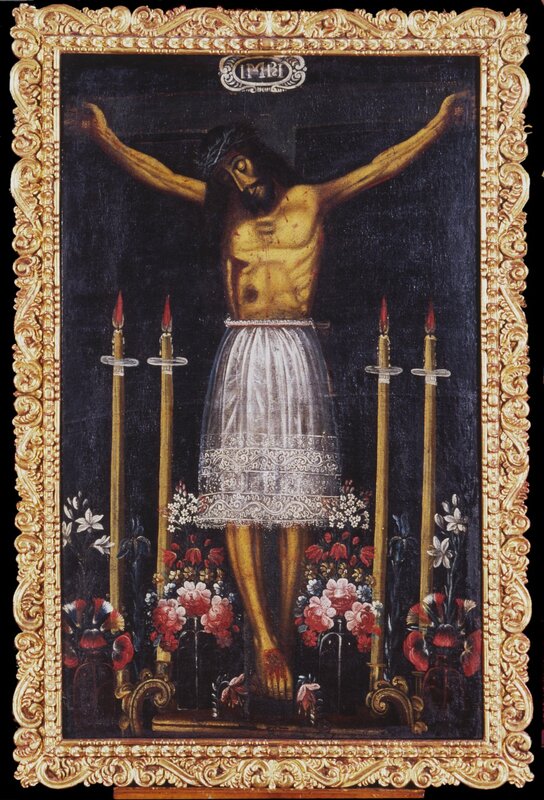 This is one of many paintings of a sculpted crucifix that hangs in Cuzco’s cathedral. The statue was widely believed to have brought the great earthquake of 1650 to an end, a divine intercession into human disaster. 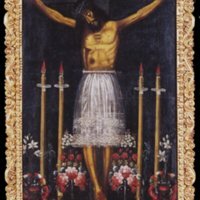 After the devastating quake, painted copies of the miracle-working Crucifix were made, each one a “portrait” of the venerated crucifix. They were seen to carry some of the effective powers of the statue itself. One of the identifying marks of Christ of the Earthquakes is the demure skirt that Jesus wears. The skirt, rather than a loincloth, is somewhat unusual on the crucified Christ. Four long lit candles flank the statue, a consistent feature in these paintings of Christ of the Earthquakes. Paintings of the miracle-working crucifix show the flower-laden altar below, a sign of the public’s devotion. The painting is unsigned and likely was made by one of many painters from Cuzco’s numerous workshops. The painting is oil on canvas, the most common material for paintings in 18th-century Spanish America. Today the crucifix is still venerated in Cuzco’s cathedral. In the 18th century, painted copies of the Christ became common, spreading to towns quite far away from Cuzco. The visual iconography of these paintings is quite consistent, suggesting that they may have derived from one, or a group of very similar paintings. People in Spanish America strongly believed in possibility of divine intercession. Natural disasters—like earthquakes and floods—were interpreted as signs of God’s anger, and Jesus, Mary and the saints, through their images, were often invoked to intercede. In this case, painted copies of the miracle-working statue were made to commemorate the supernatural event of 1650 and invoke Christ’s powers of protection in the future. Stanfield-Mazzi, Maya. 2007. "Shifting Ground: Elite Sponsorhip of the Cult of Christ of the Earthquakes in Cusco." Hispanic Research Journal 8 (5): 445-465. Wuffarden, Luis Eduardo. 1999. ‘El Cristo de los Temblores.” In Los siglos de oro en los virreinatos de América: 1550-1700. Madrid: Sociedad Estatal para la Conmemoracion de los Centenarios de Felipe II y Carlos V, 354-356.